Chairs are a very important part of any space. It is only fitting that my first journal post discusses iconic chairs that anyone should consider for their space. There are a few iconic chairs that standout as true icons. They can be found in countless movies, and even countless more interior design student projects. It may very clichè to do so, but I want to give my top 5 iconic chairs and give you the reason why they are worthy of being a part of your living space. This chair is one of two chairs from Ray and Charles Eames that makes my list. One of the main reasons I like this chair is the fact that it utilizes a cutting edge technology (cutting edge for the time). The bent and molded laminated plywood creates beautiful lines while also providing ergonomics that make the chair a joy to sit in. If you've never sat in one, I highly recommend trying it out. Ray and Charles Eames were obsessed with incorporating the human factor into their designs and this chair is no exception. The organic, flowing lines make it a lyrical addition to a living space. This is truly one of the iconic designs of the last 100 years. Florence Knoll studied under two of the greats of design, Van der Rohe and Saarinen. She is a tour de force in the interior design world. Chances are, you've sat in one of her chairs. As an architect who believed that it was important to design every detail, including the furniture, Knoll wanted her pieces to be considered a part of a whole. Her designs are ubiquitous in office landscapes around the world. The chair is as beautifully modern as it is practically comfortable. A true representation of form and function. Even though these are a perfunctory piece of office lobby fair, they definitely have a place in a well appointed sitting area in a residence as well. The cleanliness of the line make it a great jumping off point for a room's design. They look amazing in pairs! Jens Risom was another designer who's orbit came into contact with Knoll. Long before Scandinavian Design became universally associated with painfully pretentious furniture with equally pretentious names, Risom was responsible with laying the foundation for the aesthetic by which Scandinavian Design is well known to this day. The Scandinavian ideal that beauty and function should be accessible and affordable is not unique to northern Europe, but Risom brings the ideal close to perfection in his Lounge Chair. The marriage of the flowing lines of the frame with the edgy geometry of the woven webbing are well balanced and can anchor any room. van der Rohe's Barcelona Chair is one of the true harbingers of the rise of the modern design era. 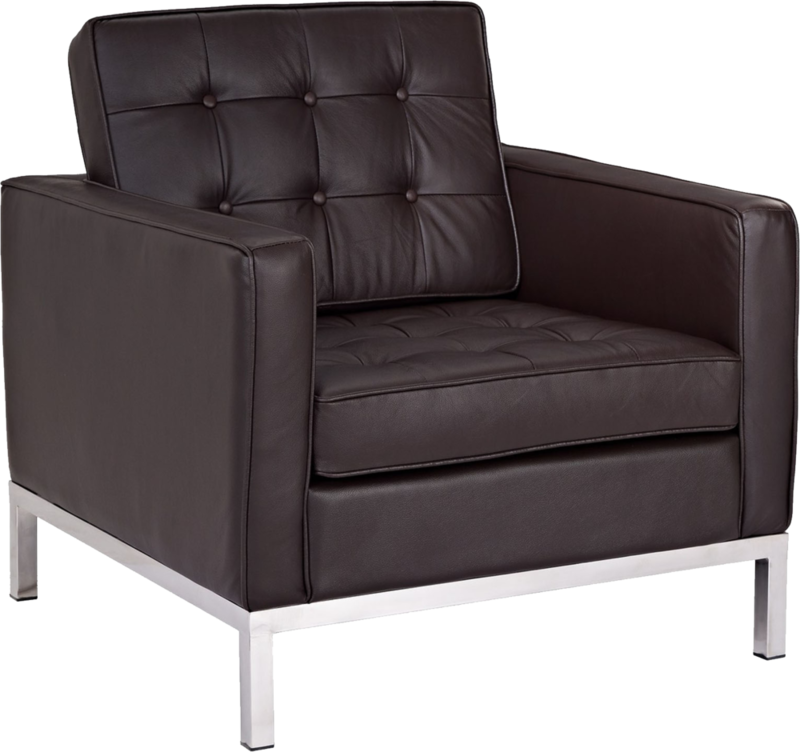 Making its major debut during the 1929 World Fair held in Barcelona (hence the name), the Barcelona chair took an ancient design aesthetic (the curule seat) and brought it into the future. van der Rohe famously quipped that "less is more," and the Barcelona Chair hits that nail right on the head. By utilizing the strength of stainless steel, the airy frame effortlessly cradles the simple, tufted cushions. It not only feels great to sit in, the unobtrusive nature of the design make it a good fit for many different applications. I don't have any data to back this claim up, but I'd be willing to bet good money that not a single year passes without a movie being made that includes this iconic design...and it was designed nearly 90 years ago! Bookending my top 5 is another iconic char from Ray and Charles Eames. The only chair that can be seen in more movies than the Barcelona Chair, is the Eames Lounge Chair. Both the Knoll and Barcelona chairs have ottomans available, but the Eames Lounge Chair is hardly a chair without its ottoman. As an extrapolation of the club chair, this ultra plush chair has "the warm receptive look of a well-used first baseman's mitt," according to Charles Eames. This is a chair to nap on, to read on, to watch tv on; basically to do anything that requires being off of your feet. Imagine this wonderful chair greeting you at the end of a long day. Though it may seem like I am beholden to mid-century modern design with this top 5, I would contend that it just so happens that the rise of modernism also corresponded with the pinnacle of chair design...and everything since then has been a squirrel trying to find a nut. Of course there are contemporary designers who are worthy of a top 5 spot, but it just so happens that it is hard to bounce one of these off when you'd be hard-pressed to find a contemporary designer who doesn't find their main inspiration from at least one of these designs.